The date was Friday, July 15, 1955—two days before the grand opening of Disneyland. Readers of the Long Beach Press-Telegram, the Santa Ana Register and other Southern California newspapers found an advertising supplement for Disneyland in their papers. Not only were there articles highlighting all the wonderous attractions that guests would find, there were also ads from Disneylands sponsors. Richfield Oil Corporation had a particularly striking ad. 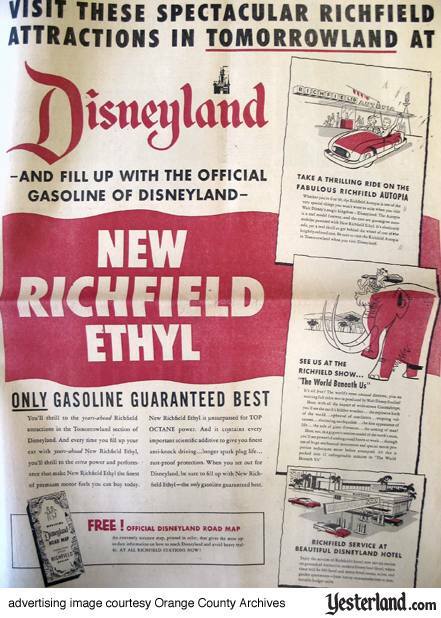 Richfield wanted readers to know about their “years-ahead Richfield attractions” at Disneyland—but they were even more interested in telling readers about their “years-ahead New Richfield Ethyl” gasoline. You’ll thrill to the years-ahead Richfield attractions in the Tomorrowland section of Disneyland. And every time you fill up your car with years-ahead New Richfield Ethyl, you’ll thrill to the extra power and performance that make New Richfield Ethyl the finest of premium motor fuels you can buy today. New Richfield Ethyl is unsurpassed for TOP OCTANE power. And it contains every important scientific additive to give you finest anti-knock driving ... longer spark plug life... rust-proof protection. When you set out for Disneyland, be sure to fill up with New Richfield Ethyl — the only gasoline guaranteed best. An extremely accurate map, printed in color, that gives the most up-to-date information on how to reach Disneyland and avoid heavy traffic. AT ALL RICHFIELD STATIONS NOW! Whether you’re 6 or 60, the Richfield Autopia is one of the very special things you won’t want to miss when you visit Walt Disney’s magic kingdom — Disneyland. The Autopia is a real model freeway, and the cars are gas-engine automobiles powered with New Richfield Ethyl. It’s absolutely safe, yet a real thrill to get behind the wheel of one of the brightly-colored cars. Be sure to visit the Richfield Autopia in Tomorrowland when you visit Disneyland. It’s all free! The world’s most unusual diorama, plus an exciting full color movie produced by Walt Disney Studios! Here, with all the impact of wide-screen CinemaScope, you’ll see the earth’s hidden wonders... the explosive birth of the world... upheaval of continents... erupting volcanoes... shattering earthquakes... the first appearance of life... the rule of giant dinosaurs... the coming of man! Enjoy the services of Richfield’s brand new service station on the grounds of distinctive, modern Disneyland Hotel, where there will be 650 hotel and motor-hotel rooms, suites, and garden apartments — from luxury accommodations to comfortable budget units. In the ad, Richfield proudly boasted of their “New Richfield Ethyl” gasoline. The term “ethyl” comes from tetra-ethyl lead, a common gasoline additive that raised octane and thus prevented pre-ignition (“knocking”) in high-compression engines. Yes, Richfield was bragging about leaded gasoline. Richfield sponsored Disneylands Autopia attractions from 1955 until 1970. The World Beneath Us closed in 1960. So what ever happened to Richfield? In 1966, Richfield Oil Corporation merged with Atlantic Refining Company. The result was the Atlantic Richfield Company, which acquired Sinclair Oil Corporation in 1969 and Anaconda (a mining company) in 1977. In 2000, BP Amoco acquired Atlantic Richfield. Richfield survives as the R in ARCO—the acronym for Atlantic Richfield Company and a major gasoline brand west of the Mississippi River. Richfield advertisement from 1955 courtesy Orange County Archives; Scanned from an advertising supplement to the Santa Ana Register, July 15, 1955. Detail images scanned and enhanced for web use by Chris Jepsen, and further enhanced by Werner Weiss.